EBONY Marinoff is hard to miss, both on and off the field. The Adelaide midfielder, the inaugural winner of the NAB AFL Women's Rising Star Award, lit up the AFLW competition this year with her joy and passion for the game. At just 19, Marinoff can be fierce on the field, finishing the seven-game home and away season with a competition-high 70 tackles. But she also has a lighter side, exuberantly celebrating teammates' goals and also starring in comedic GIFs with teammates for the Crows' social media accounts. Marinoff came to attention last year when, after being drafted seventh overall, she said she was swapping netball for footy because she liked the physicality. The talented athlete also put her surf lifesaving to one side to focus on football. "There did come a time where footy, netball and surf lifesaving started clashing so I thought I would give footy a red-hot crack, knowing there was going to be a national league," Marinoff said after being drafted. "I thought I'd hang up the bathers, put the netball skirt away and live and breathe football." The Crow was nominated for the Rising Star award in round one after a 20-disposal, six-tackle effort in Adelaide's big win over Greater Western Sydney. Marinoff beat 13 other nominees, including Brisbane Lions Tayla Harris and Sabrina Frederick-Traub and Melbourne Lily Mithen, to be named Rising Star at Tuesday night's W Awards in Melbourne. Earlier in the night, she was picked on the interchange bench in the Virgin Australia AFL Women's All Australian team. Marinoff was consistently among Adelaide's best players, and finished the season on a high last Saturday afternoon on the Gold Coast with a 20-disposal game and a premiership medal. Amid the post-match celebrations, the teenager appeared to be a self-appointed custodian of the AFLW premiership cup. Marinoff said Tuesday night's honour was a humbling individual honour after a season that had been focused on team success. "Saturday was a very special moment, for not only myself, but for the rest of the team. 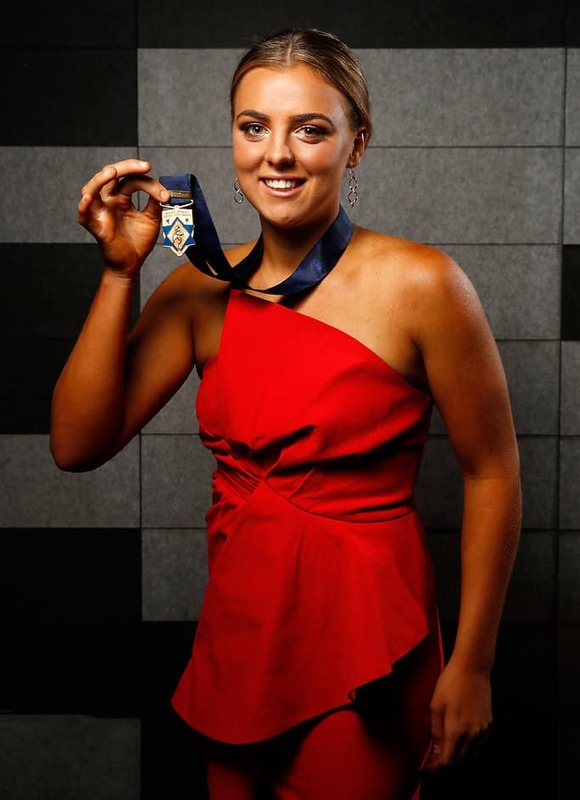 To cap off an amazing first AFL Women's season with a premiership and then to come here tonight and take home the Rising Star is just such an honour," she said. She conceded there had been moments when she allowed herself to dream of winning the award, but she kept them to herself. "I'd be lying if I said I hadn't thought about (winning the Rising Star) because it's been a big week with media. I didn't like talking about it because it made me nervous, because it could have gone either way," she said. Marinoff was drafted from South Australian club Morphettville Park, with which she has won three consecutive flags. She was named an All Australian in 2016 after the AFL women's exhibition series. The left-footer played her junior footy with Lockleys JFC in Adelaide's inner west, and has represented South Australia since 2012 at under-16, under-18 and open levels.